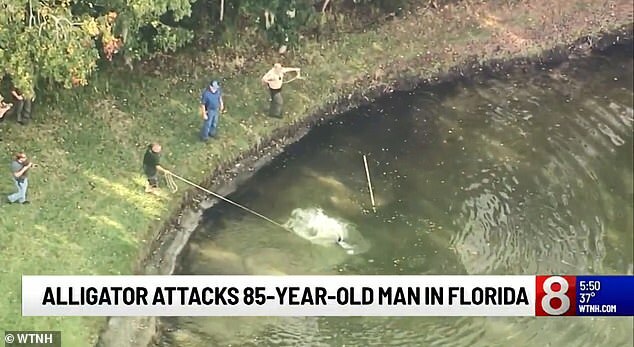 A sheriff’s office in Florida has released frantic 911 calls from bystanders reporting an alligator attack at a retirement community that nearly killed an 85-year-old man earlier this week. Ihle’s wife heard the man’s screams and found him on the ground bleeding from a wound on his right foot. 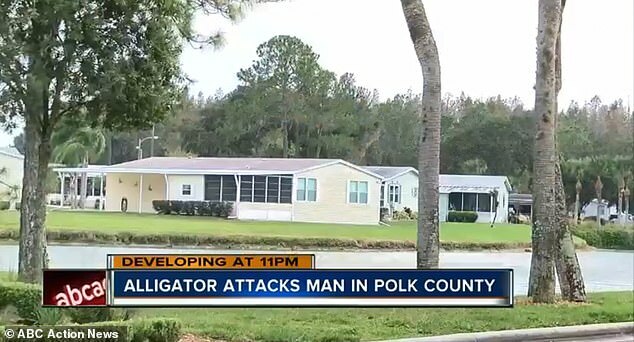 Another witness called in telling the disaptcher: ‘There’s a gator eating a man,’ reported ABC News. 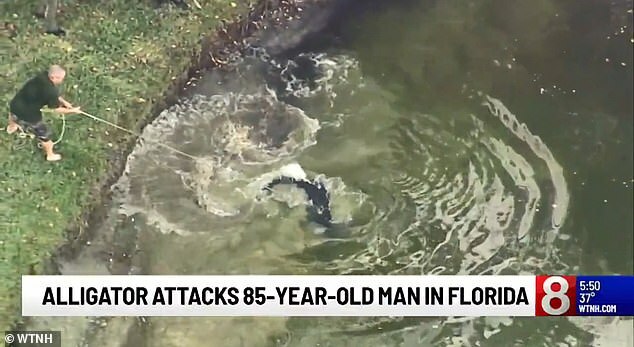 According to a post on the retirement community’s website, Ihle was attacked by the alligator while chasing birds off his property. 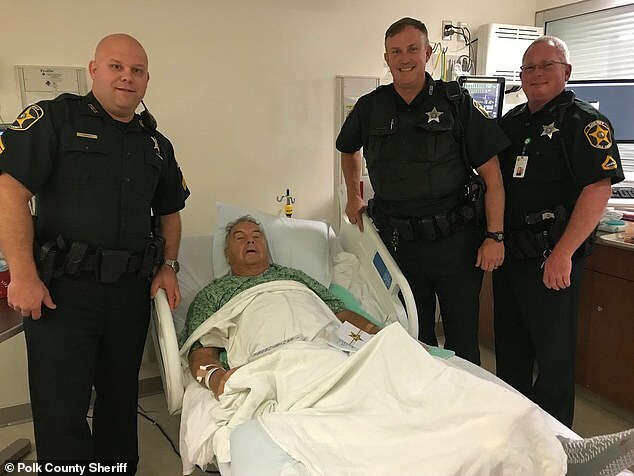 Landscaper Edward Donnelly was working nearby when he heard the resident’s screams and found the man lying in agony on the ground with his foot looking ‘gruesome,’ as the Good Samaritan told Bay News 9. 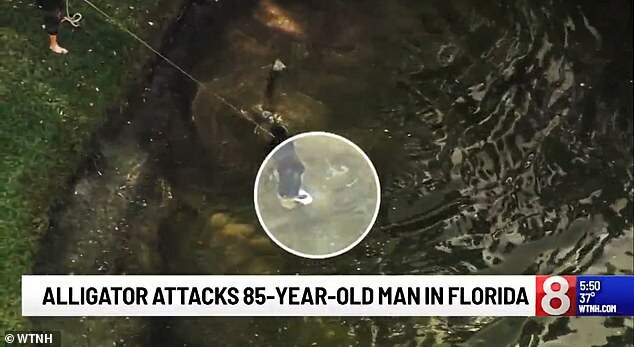 He said the victim told him that after locking its jaws on his foot, the alligator attempted to drag him down into the water. Canadian tourist Scott Pearson and taking a walk with his wife when he witnessed the attacked and also came to Ihle’s rescue, reported WFLA. Pearson, whose parents live at the retirement village, took off the shirt off his back and used it to stop the bleeding. WTNH reported that Ihle was taken to Lakeland Regional Medical Center, where he underwent surgery to save his foot. He is expected to recover. 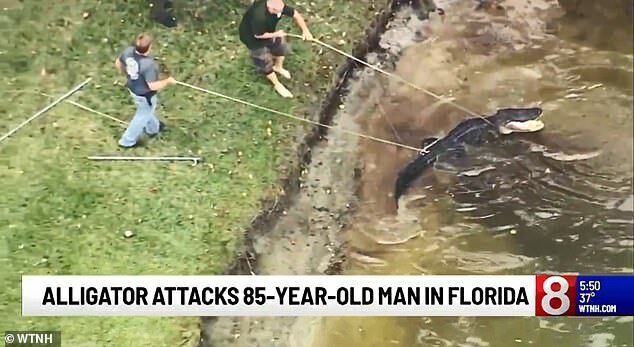 Florida Fish and Wildlife Conservation Commission then had a licensed trapper come in and remove the nuisance alligator from the pond. Video captured the moment the 9-foot-9 beast was yanked out of the water with Ihle’s white sneaker still in its jaws, confirming that it was the right animal. 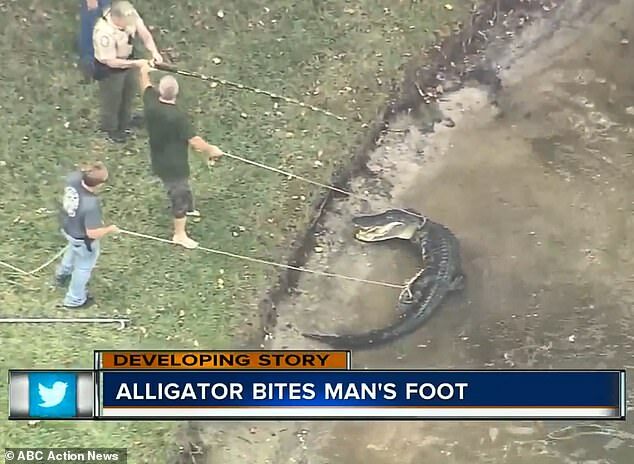 Once on dry land, the alligator was pinned to the ground, restrained and carted away. According to wildlife officials cited by ABC Action News, the alligator will likely be euthanized.